50 years ago, Montréal was readying itself to celebrate its 325th birthday. And to host a very big party: Expo 67, considered the 20th century's most successful World Fair. The other big birthday gift the city (or more specifically, its spendthrift mayor Jean Drapeau) gave itself was a subway. These days, the métro is celebrating its first half century of service. It does so with fanfare - literally: As part of the 50th anniversary celebrations, Montréal's Symphony Orchestra premiered a purpose-written piece inspired by the sounds of the trains. Unfortunately, I missed the performances, but I imagine it must sound somewhat similar to Arthur Honegger's Pacific 231. Yes, that oeuvre represented an accelerating steam engine. But Montréal's métro isn't much more modern: The most benevolent way to describe its rolling stock would be "vintage". The trains have not changed in 50 years, and still ooze of the sixties, with their neon lights and dot-matrix displays. Only in the past months, after years of delay courtesy of the standard inept cronyism, have new trains started arriving. They will bring a breath of fresh air - albeit not too fresh, for they are still not air-conditioned. Why not? 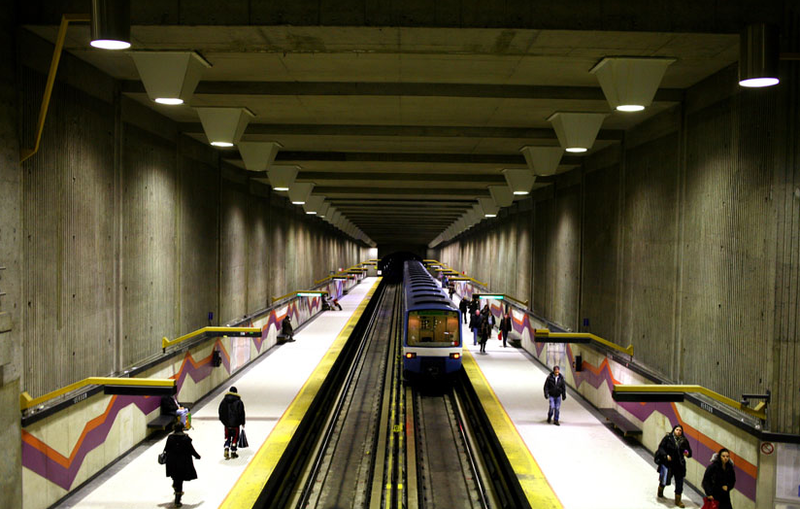 Because Montréal's subway, following the well-honed French tradition of function follows form that also gave the city an Olympic Stadium with a retractable roof that can't support snow, was built with inadequate ventilation. This means it is uncomfortably hot at any time of the year, and there is no way to evacuate the surplus heat that air-conditioned trains would blow off. While the city prides itself on the public art installed at each station, and their individualized designs (many look like Ken Adam's movie sets), it tends to keep mum on the fact that even the stations with escalators all include at least one unavoidable flight of stairs, frustrating people in wheelchairs or prams and requiring the very costly, and slow, refitting with elevators. Novelty in the last 50 years has been limited. In 2009, 12 years after Hong Kong, the transit operator started using RFID cards for tickets, but it has continued its restrictive ticketing practices dating back to scratch-card days ever since. More recently, screens indicating time to the next departure appeared, although they still fail to provide accurate information when it is needed most, namely when something is going awry. And while the city has been growing steadily since 1966, the metro has not kept pace: Several planned extensions have been abridged or cancelled, and to this day they remain subject to the political mood of the day. Shortcomings notwithstanding, the métro remains a safe, largely reliable and efficient way of inner-city transport. 50 years after its inauguration, it doesn't just save time travelling. It also lets you travel back in time.